Alfred Sisley was born into an international family whose historical ties to both France and England went back several generations. In his immediate family, he was the youngest of four children and the only one to be born in Paris—on 30 October 1839. His childhood was spent in the tenth arrondissement where his father, William, was an importer of luxury goods. This particular district included two of the city’s largest railway stations (Gare de l’Est and Gare du Nord) as well as the bucolic Canal St. Martin, the subject of several of Sisley’s early paintings. At age seventeen, Sisley went to London to study business at his father’s request, and to meet his English relatives, as well as improve his English language skills. By all reports, his English skills did improve, but most of his three years there were spent studying the paintings of J. M. W. Turner and John Constable. When he returned to Paris in 1860, it was obvious that his career would be in art rather than business. Sisley’s formal artistic training began in the studio of Charles-Gabriel Gleyre where he met three of the men with whom his future would be entwined: Pierre-Auguste Renoir, who arrived in 1861, and Claude Monet and Frédéric Bazille who began their studies in November 1862. The following Easter, the four friends made a painting trip to the village of Chailly in the Forest of Fontainebleau, following in the footsteps of an earlier generation that included Camille Corot, Jean-François Millet and Théodore Rousseau as well as the rest of the Barbizon painters. For all of these young artists, the 1860s were the key formative decade in their careers; they made their first submissions to the Salon, and witnessed the succés de scandale of the Salon des refusés; they developed a fresh approach to landscape painting and admired intensely the work of Edouard Manet. They advocated the cultural and aesthetic position that they should be the “painters of modern life” that Charles Baudelaire has demanded in his 1863 essay; and they also began planning the independent exhibitions that would later bring them notoriety. In a personal context, they formed lifelong friendships that would continue to sustain them throughout their careers. For Sisley, as for his colleagues, the 1860s brought a mixture of excitement and frustration. After leaving Gleyre’s studio in 1863, Sisley, Renoir, Monet and Bazille continued their painting expeditions to the Forest of Fontainebleau, expanding the group to include Camille Pissarro as well as the painter Jules Le Coeur. In 1866, all four of Gleyre’s alumni submitted paintings to the Salon—and even more remarkably, all four were accepted, as was their new colleague, Berthe Morisot. Sisley’s debut paintings were Village Street in Marlotte and Village Street in Marlotte-Women Going to the Wood. This initial Salon success was short-lived however; the following year, all were rejected, prompting Sisley, Renoir, Bazille, Pissarro and Paul Cézanne to sign a petition demanding a new Salon des refusés—a document that was largely ignored by the government. Salon recognition would continue to be sporadic for Sisley. Although he submitted work regularly during the 1860s, it was accepted only three times. In each case, the approved paintings depicted the suburban landscapes around Paris: Avenue of Chestnut Trees at la Celle-Saint-Cloud in 1868, and Barges on the Canal St.-Martin and View of the Canal St.-Martin in 1870. The second half of the 1860s also brought important personal changes for Sisley. In his early twenties, he had lived with his parents while studying with Gleyre, but he seems to have rented his own studio by July of 1865. [i] A year later, on 17 August 1866, he was painting on the Normandy coast with Renoir and Le Coeur when he learned of the death of his mother, Felicia. This loss coincided with the development of Sisley’s romantic relationship with Marie Louise Adélaide Eugénie Lescouezec, a floral designer who lived in the seventeenth arrondissement in northwestern Paris; on 17 June 1867, the young couple welcomed their first child, Pierre, into the world. Sisley’s father, William, seems to have learned of this liaison with considerable disfavor, terminating any further financial assistance to his son as well as any significant communication. The birth of a daughter, Jeanne Adèle, on 29 January 1869, would only add to William’s anger at his son’s rejection of the bourgeois values he had been taught to respect. [ii] It is important to note that Sisley has often been presented in art historical literature as having enjoyed the comforts of marriage and middle class life; this is a fiction. He and Eugénie did not marry until 1897, and then only for the legal protection of their children. When the war ended, the world was a very different place. The Prussian army was occupying France; Paris had experienced a cataclysmic civil war during the Commune; and the French nation had lost the provinces of Alsace and Lorraine as well as its collective confidence. In short, the glorious exuberance of the Napoleon III’s Second Empire was over. The hard work of rebuilding a nation under an occupying power had begun. For Sisley and his friends, this meant struggling under ever more dire conditions, trying to sell their work in a community that clung to the security of traditional academic painting as a symbol of their much-diminished national pride. The bright spot in this bleak environment was the involvement of art dealer Paul Durand-Ruel, who began to buy Sisley’s paintings in 1872, and to show them both at his gallery on the rue Laffitte in Paris and in London at 168 New Bond Street; this relationship would continue throughout Sisley’s career. Sisley’s life becomes increasingly peripatetic in the years following the Franco-Prussian War. Having survived the war inside a besieged Paris, he again moved his family to the outlying suburbs in late 1872. Monet and Pissarro were already there, where life was less expensive but still only a short train ride away from Paris. It was from this base that the now “thirty-something” artists resumed their discussions about establishing an independent artists society that would sponsor exhibitions outside of the institutionalized structure of the Salon. This idea had first been proposed in the happier days before the war, and plans had actually been initiated then, but it not was until 27 December 1873 that the group formally organized itself as the Société anonyme cooperative d’artistes-peintres, sculpteurs, et graveurs. Sisley was a founding member, together with Monet, Pissarro, Renoir, Morisot and Edgar Degas, who had recently returned from New Orleans. Friends of Pissarro and Degas were also members of this original group, including Edouard Béliard, Armand Guillaumin, Ludovic Lepic, Leopold Levert, and Henri Rouart. Having set their course, the Société anonyme members rented space from the photographer Nadar at 35 boulevard des Capucines in Paris, and opened the doors to their first exhibition on 15 April 1874. Sisley exhibited five paintings: Route de Saint-Germain, Île de la loge, La Seine à Port Marly, Verger, and Port Marly, soirée d’hiver. [v] The show attracted considerable attention, drawing 200 people on opening day, and 100 people per day thereafter. Critical reaction, although sometimes stinging, was generally supportive. 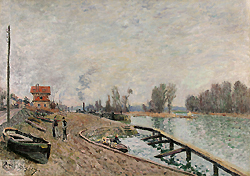 Sisley’s painting, La Seine à Port Marly, was described by Ernest Chesneau as having “surpassed any work of the past or present in its ability to evoke the physical sensation of ‘plein air’ atmosphere.” [vi] Nonetheless, sales were modest. The negative reception of the first Impressionist exhibition has long provided fodder for the now mythic saga of the struggling modernist painters. However, art historian Paul Tucker debunked the accepted canonical reasons for this phenomenon in his 1974 essay “The First Impressionist Exhibition in Context”. [vii] According to Tucker, the disapproving criticism came largely from writers who saw Impressionism not only as a challenge to the traditions of the French Academy, and by extension the Ecole des Beaux-Arts, but more significantly, as an affront to French cultural sovereignty. He notes that in spite of a convincing argument to the contrary, “…the Impressionists still could be perceived by conservative critics as subversive, given the climate of opinion after the war.” [viii] The politics of art—and the opening of the first Impressionist exhibition at a moment when Paris was struggling to pay off the German war debt while simultaneously accommodating thousands of refuges from Alsace and Lorraine—was at least as much of a liability as the radical aesthetic innovations in their composition, color and brushwork. The first Impressionist exhibition closed on 15 May 1874, and Sisley left for England six weeks later where he spent the summer and autumn painting near Hampton Court and East Molesey on Thames. On returning to France, he again found himself in ominous financial circumstances and moved his family to yet another suburban location, this time at Marly-le-Roi. This pattern of constant moving persisted for most of Sisley’s life; on average, he moved his family every other year, alternating between moving to better or worse accommodations depending on the sales of his paintings. Again, the fiction that Sisley’s life was economically secure and contentedly middle class is not supported by the facts. In addition to the pioneering efforts of the independent exhibitions, Sisley also participated in a variety of auctions and exhibitions at private galleries beginning in the mid-1870s. The emergence of galleries such as Durand-Ruel and Georges Petit in Paris was a relatively new aspect of the French art market, which had previously been largely controlled by the Salon under the auspices of the French Academy. For Sisley, as for most of his colleagues, the expansion of private galleries was a major advantage in the development of their careers. The pubic auction house, Hôtel Drouot, was also to prove a helpful source of income for the impoverished painter. In March 1875, he sold twenty-one paintings there; Renoir, Monet and Morisot also did well at the same sale. Three years later, in 1878, thirteen of Sisley’s paintings were included the second sale of the Hoschedé collection at Hôtel Drouot. Perhaps more importantly, an entire chapter in Théodore Duret’s pamphlet, Histoire des peintres impressionnistes was devoted to Sisley’s work, thus underscoring his reputation as one of the most innovative painters in Europe. Financial misery continued to plague Sisley in spite of his growing recognition as a painter, and by 1880, he found himself signing an agreement with Durand-Ruel relinquishing the rights to many of his paintings in exchange for steady financial support. This type of agreement was not uncommon, but it often led to acrimonious feelings among the artists. Many years later, on 12 April 1891, Sisley remarked to Pissarro that Durand-Ruel was their “worst enemy.” [x] Coming as it did after years of frequently productive projects with Durand-Ruel, this comment suggests that the arrangement continued to be awkward for Sisley at best. As always, Sisley and his friends encouraged each other in their efforts to find new venues for exhibitions. 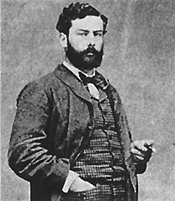 A typical example was Renoir’s generosity in introducing Sisley to publisher Georges Charpentier in the winter of 1881. Renoir had long worked for Charpentier, and knew that the publisher was showing a variety of art works at the premises of La Vie Moderne, the magazine he had launched in 1879. The result was a show of fourteen of Sisley’s paintings. In general, the French economy improved after 1883 when it became clear that the nation was finally emerging from the Prussian-imposed restrictions of the 1870s. Durand-Ruel mounted two shows where Sisley’s works were featured prominently, one in London with eight paintings, and more importantly, a solo exhibition at Galerie Durand-Ruel in Paris. Two years later, Durand-Ruel organized a group exhibition at the Hotel du Grand-Miroir in Brussels, entitled Exposition de MM Degas, Monet, Pissarro, Renoir et Sisley. This was just the beginning of a new international market. Like many other French gallery owners, Durand-Ruel was increasing aware that the American market presented a fresh—and potentially open-minded—group of collectors. In 1886, he made his first foray into the United States, in collaboration with the American Art Association, at the American Art Galleries in New York. The show, entitled Works in Oil and Pastel by the Impressionists of Paris opened in April, and then traveled to the National Academy of Design in late May and June. Shortly thereafter, Durand-Ruel opened a branch of his own gallery in New York to better serve the American market. By 1889, Sisley’s works were carefully introduced to American collectors in Works by Alfred Sisley, a solo show of twenty-eight paintings. In 1891, he made his “debut” in Boston, along with Renoir and Monet, in Paintings by the Impressionists, again organized by Durand-Ruel. Back home in Paris, Sisley had also attracted the attention of the Galerie Georges Petit where he participated in the Sixth International Exhibition along with many of his friends and colleagues. In addition, he joined Renoir and Pissarro in a show at the Galerie Durand-Ruel in 1888 where, for the first time, he sold a painting to the French government—a bittersweet triumph because the government promptly sent September Morning to the regional museum at Agen where it was completely ignored. More productively, that same year Sisley was invited to exhibit with the Belgian secessionist group known as Les Vingt, a relationship he would cultivate throughout the 1890s. The Parisian arts community of the 1890s was filled with a plethora of diverse—and divergent—artists and ideas. The tiny breach in the French art establishment that had been created in the 1860s had become a flood of fresh ideas, techniques and aesthetics. Sisley found himself living in a world populated by figures as radically different as Jean-Léon Gérôme and Henri Toulouse-Lautrec, not to mention the young Henri Matisse. It is no surprise, however, that the unassuming—and now 59-year-old—Sisley would support the efforts of yet another independent group seeking to establish open venues for artists to exhibit their work. In 1890, he became a member of the Société Nationale des Beaux-Arts, exhibiting six paintings at initial Salon at the Champs-de-Mars. This was the first of many splinter groups that would challenge the established Salon in fin-de-siècle France; in this case, it was organized by a group of academically trained artists, including Ernest Meissonier, Pierre Puvis de Chavannes and Auguste Rodin, who had grown increasingly weary of the rigid and polemical positions of their colleagues at the Ecole des Beaux-Arts. Sisley would exhibit paintings at the “new” Salon in 1891, 1892, 1894, 1895 and 1898. By this time, Sisley’s typically precarious financial status seems to have stabilized. In addition to his participation in the Sociéte Nationale and Les Vingt, he had a one-man show at Boussod et Valadon in Paris in 1893, and a large retrospective of 146 paintings and six pastels at Galerie Georges Petit in February of 1897. In July of 1897, probably with the proceeds from the Georges Petit sales in hand, Sisley and Eugénie traveled to England for three months. Initially, they spent time in Cornwall, but then moved on to Wales where Sisley painted the dramatic coastline. It was in August that Sisley and Eugénie visited the French Consulate in Cardiff, and signed documents acknowledging his paternity of Pierre and Jeanne. Two days later, on 5 August 1897, they were married at the Cardiff Register Office, thirty-one years after their liaison began. By October, they were once again at home in Moret-sur-Loing. The year 1898 started well enough with an exhibition of Tableaux de Sisley at Galerie Durand-Ruel, but ended in grief with the death of Eugénie in October. Within three months, Sisley was gone as well, dying at home on 29 January 1899. He was buried two days later on1 February, in Moret-sur-Loing. In May, the Galerie Georges Petit assembled an exhibition of works by Sisley and his friends as a benefit for Pierre and Jeanne. [i] Cited in Richard Shone, Sisley, (London: Phaidon Press Limited, 1992), 34 and 225. Letter by Renoir, written “chez Sisley” at 31 avenue de Neuilly, Porte Maillot. [ii] Richard Shone, Sisley, (London: Phaidon Press Limited, 1992) 43-46. [iii] Cited in Richard Shone, Sisley, (London: Phaidon Press Limited, 1992), 46-47. Original source: letter from Sisley to Adolphe Tavernier, 19 January1892, Moret-sur-Loing, (Fondation Custodia (F. lugt coll. ), Institut Néerlandais, Paris 1937-A1). [iv] François Daulte, Alfred Sisley, Catalogue raisonné de l’oeuvre peint, (Paris: Editions Durand-Ruel, 1959), 42-44. [v] For a facsimile reproduction of the original catalogue from the first Impressionist exhibition, see Charles Moffatt, The New Painting, Impressionism 1874-1886, ex. cat., (San Francisco: The Fine Arts Museum of San Francisco, 1986), 123. [vi] Quoted in Paul Tucker’s essay “The First Impressionist Exhibition in Context” in Charles Moffatt, The New Painting, Impressionism 1874-1886, ex. cat., (San Francisco: The Fine Arts Museum of San Francisco, 1986), 108. Original source: Ernest Chesneau, “À coté du Salon”, Le Soir, 7 Mai 1874. [vii] Paul Tucker, “The First Impressionist Exhibition in Context” in Charles Moffatt, The New Painting, Impressionism 1874-1886, ex. cat., (San Francisco: The Fine Arts Museum of San Francisco, 1986), 92-117. [ix] Quoted in Charles Moffatt, The New Painting, Impressionism 1874-1886, ex. cat., (San Francisco: The Fine Arts Museum of San Francisco, 1986), 418. Original source: Ernest Chesneau, Paris-Journal, 7 mars 1882. [x] Richard Shone, Sisley, (London: Phaidon Press Limited, 1992), 230.